Keep your favorite plants protected from your garden hose with these DRAMM Garden Hose Guides. This set of 6, innovative stakes is perfect for lining a large garden bed, stopping hose from ruining tender plants. An 8.25" long socket forms the base of each guide, inserting easily into soil thanks to the pointed base. A 4" diameter, flat disc tops each socket, sitting flush with your yard, and also supports the included, 10.25" long post top on each. The flared top of each stake keeps them visible, while the gap between the cap and base disc accommodate your garden hose. 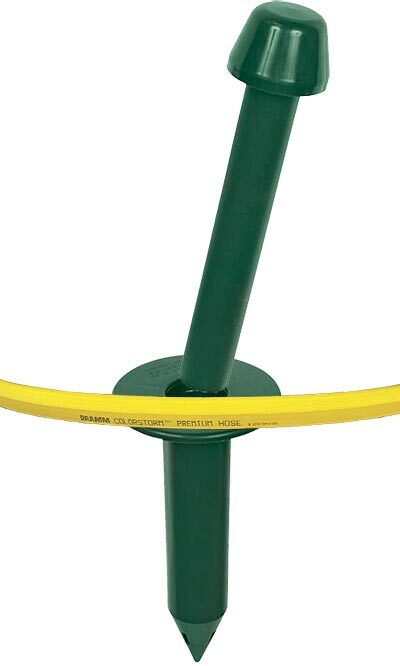 The posts can spin in each socket, making it simple to pull your hose where needed without friction, and the toppers can also be removed from the base for mowing. For even more versatility, the base of each item may be used as a ground socket, supporting a pole or other outdoor adornment. Crafted from plastic, these guides will last for many seasons, and the dark green color of each meshes with your grass. Direct garden hose away from your flowerbed using these Garden Hose Guides. Made in the USA. Note: This case pack includes 6 of the DRAMM Garden Hose Guides.